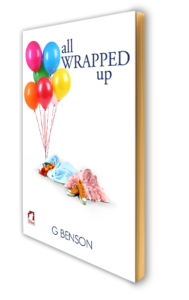 All Wrapped Up (shortstory, 2015): Who doesn’t love a birthday party? Especially a toddler’s. There’s sugar, balloons, games—all the makings for fun; that is unless it’s the first toddler birthday party you’ve ever planned in your life. It can’t be that hard, Anna Foster decides; and when she’s decided something, that’s it. The ones she attended as a guest were a blast, and surely there’s nothing that over organisation, a checklist or three, and a Type A personality can’t fix, right? Though the smirk her mother keeps throwing her way is a little off-putting. Maybe four checklists would be better. Or maybe a glass of wine. Order “All Wrapped Up” at Ylva Publishing.